The previous paradox stated that virtue is the only good and if virtue is the only good then logically virtue alone is sufficient for happiness and that is what this paradox is all about. It’s a short essay being no more than 3 pages long! On the flip side though there is much content that can be elaborated provided you peruse it carefully. So onwards we go with the commentaries! Fortune by its nature is external, tangible and conditional and as fortune manifests as events it’s often beyond our control that’s why it’s also called luck. Virtue in contrast is internal, intangible and unconditional, it’s a set of principles adopted by nothing else but one’s mind and as virtue is in the province of mind it’s within our control. Therefore virtue is immune to the dictates of fortune. The word virtue, reading Cicero and Stoic literature, encompasses more than the colloquial definition of a high standard of “moral excellence” they are personality traits, ethical practise and the attitude of mind. The bounties of fortune are random and impermanent there is no guarantee that the ongoing interplay of physics and reality will unfold in a way that is favourable to anyone. The trouble here is we create our expectations by our own mind and then later when those said expectations are not manifest; we suffer as a result. The fact that a person was happy on inflicted wickedness negates the idea that they cannot be happy because of it. This statement of Cicero’s would be guaranteed to work if, on the flip side, he included societal consequences for wickedness (none was implied in this paradox) such as the presence of law and order in which those wrongdoers who are wicked will find themselves very miserable indeed! Foolishness, being unwise, makes bad decisions leading us into situations that don’t promote our happiness, so I’m with Cicero on that one! Indolence, I interpret here as living a sedentary lifestyle though pleasant in moderation; too much of it can be taxing on our physical and mental wellbeing. ‘no man can be wretched, if he is virtuous, brave, and wise.‘ I can’t see a situation in which possessing the ideal qualities of being ‘virtuous, brave and wise’ would be deleterious. These qualities strike me as being full of vim and vigour; qualities of the mind that we all would be glad to have. ‘Glorious is the life of that man whose virtues and practise are praiseworthy; nor indeed ought that life to be escaped from which is deserving of praise; though it might well be if it were a wretched one ‘ Notice that practised virtue, it seems, is always linked to an individual being a social boon to society, as a utilitarian agent that gets his pat on the back and is approved by his peers; ensuring he receives kleos for his deeds. On the other hand I cast a cynical eye, I see celebrities pursuing philanthropy as a means to procure good PR. It should be asked would they still pursue their charitable deeds if the cameras were not rolling? 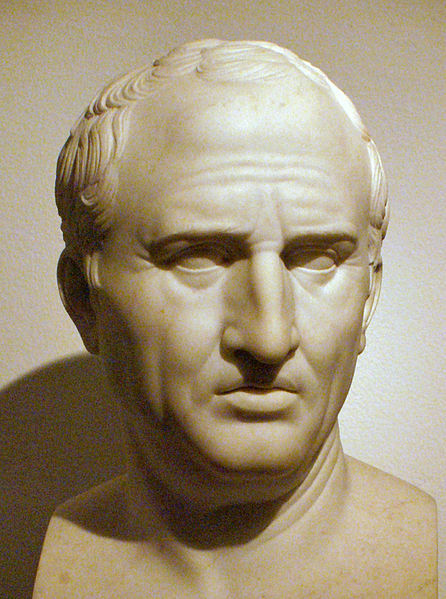 ‘We are therefore to look upon whatever is worthy of praise as at once happy, prosperous, and desirable’ All this talk on virtue being prosperous to society and praising those Roman men who performed monumental scale deeds on behalf of the people of Rome leads me to think this is a reflection of Cicero’s ethics developed in his role as statesmen working in many levels of the Roman state for he served the public in matters of law and finance (he served as quaestor in Sicily). Virtue is its own reward to the one that performs them, their deeds are looked upon as worthy of praise; again virtue implies being a productive member of society; but it’s only a boon to society if the individual possesses those personality traits and acts on them in the first place. Nevertheless I think here virtue is its own reward because the virtuous deeds you commit is rewarded by those that are indebted to you gaining trust and praise with the possibility of a ‘glory never can die’ otherwise known as kleos!